For starters, she won $25,000 to fund her start-up company at “RipTide: Hamptons Sink or Swim,” an East End version of “Shark Tank” held at The Spur. She also met experienced entrepreneurs who became mentors. “I’m around so many amazing people I wouldn’t have had access to before,” said Candela, who was born and raised in the Hamptons. She now lives on the Lower East Side of Manhattan but has a space at The Spur. Her company, Tote Taxi, transports luggage and other items between Manhattan and Montauk for weekenders and vacationers. So far, The Spur has made the most inroads in the Hamptons co-working space, but other players, such as the Surf Club, have also given it a go. Across Long Island, co-working companies — which have exploded in U.S. cities and around the world — have close to 20 locations, including 10 operated by Regus, a company owned by international workplace provider IWG. On the East End, co-working tends to take on a lifestyle cast. In certain cases, the trend has experienced a bumpy start, with some calling it “gimmicky.” Others say it’s a needed addition that will change the work landscape in the Hamptons. The most advanced — and ambitious — of these East End early co-working efforts remains the members-only The Spur. Bankrolled by local private investors, it’s currently in a temporary space near the Southampton train station and has 100 members, including local residents. Founder Ashley John Heather sees The Spur as an incubator that will promote economic growth beyond the Hamptons’ traditional service and hospitality businesses and help keep millennials on the East End. He said it also caters to weekenders’ needs for robust Wi-Fi and space to work and network. He’s already seen investments and developing partnerships among members, he said. “We’re welcoming any company doing something innovative,” said Heather, who is also the founder of White Space Group, a digital marketing agency in Manhattan, and of i-Hamptons, an entrepreneurial networking group on the East End. He hopes The Spur will help foster a new workforce in the area. “We’re not trying to be a place where service people come and charge for their time by the hour. That’s the old Hamptons,” he said. The company opened as a pop-up in the Southampton Social Club in January and recently bought a 15,000-square-foot building at 630 Hampton Road in Southampton for $4.5 million, where it has started construction on a new headquarters. Heather said the new space, which is expected to be ready toward the end of the summer, will be able to accommodate 500 to 1,000 members. The building will offer a dozen private offices, work space for 200 people, a media studio and production facility, a restaurant and bar, two event spaces and a 1,500-square-foot wellness facility. Non-resident members pay $5,000 for a peak-season membership and $2,500 off-season. An annual membership for those who own vacation property in the Hamptons goes for $6,000. For full time residents, the fee is $2,000. Heather is nothing if not ambitious. The Spur’s website shows future locations in Greenport, Sag Harbor, Montauk, East Hampton and Quogue, as well 11 other potential spots in resort towns around the country, including Palm Springs and Martha’s Vineyard. “The goal is to be a resource in premium resort towns for upscale, digitally savvy, digital nomads — a home and hub,” he said. Not all co-working ambitions work out, however. Ask real estate developer and productivity consultant Ari Meisel, who attempted to start a co-working space, Atelier, in Water Mill in 2014. “I couldn’t rent a conference room out there, unless it was very small,” he said about the impetus for the project. “I had a lot of meetings at the dining room table in my house.” But Meisel couldn’t find someone to operate Atelier, so it didn’t come to fruition. He ended up renting the space to a fitness company. 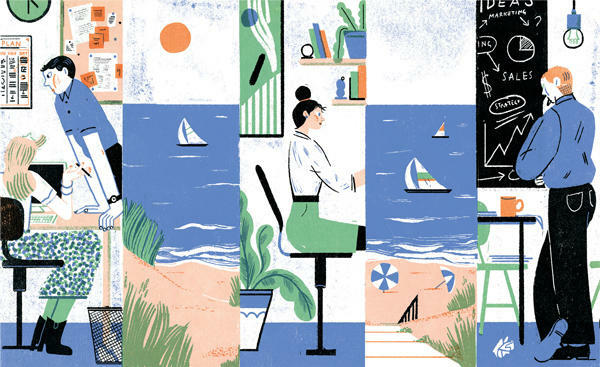 To that end, Work/Eat/Play (WEP), a Manhattan startup that repurposes spaces in restaurants and other venues for co-working, set up at both Ruschmeyer’s and the Surf Lodge — both in Montauk — last summer. WEP offers all-day coffee and high-speed Wi-Fi, among other things. It often installs power outlets to make existing spaces — think dining rooms — co-working friendly. But WEP ended up stepping away early from its deal with Ruschmeyer’s because it involved operational responsibilities unrelated to its co-working mission, said co-founder Peter Litvinenko. Ruschmeyer’s declined to comment. WEP then moved on to the Surf Lodge, where it attracted 20 to 25 residents and vacationers each weekday during the summer, charging them $95 per month or $5 per day. The company also helped develop weekend programming at the resort. Whether WEP will return to the Surf Lodge this summer was still under discussion as of early June, but Litvinenko remained enthusiastic.